Genelec for Music Creation. Sound like the Professionals! 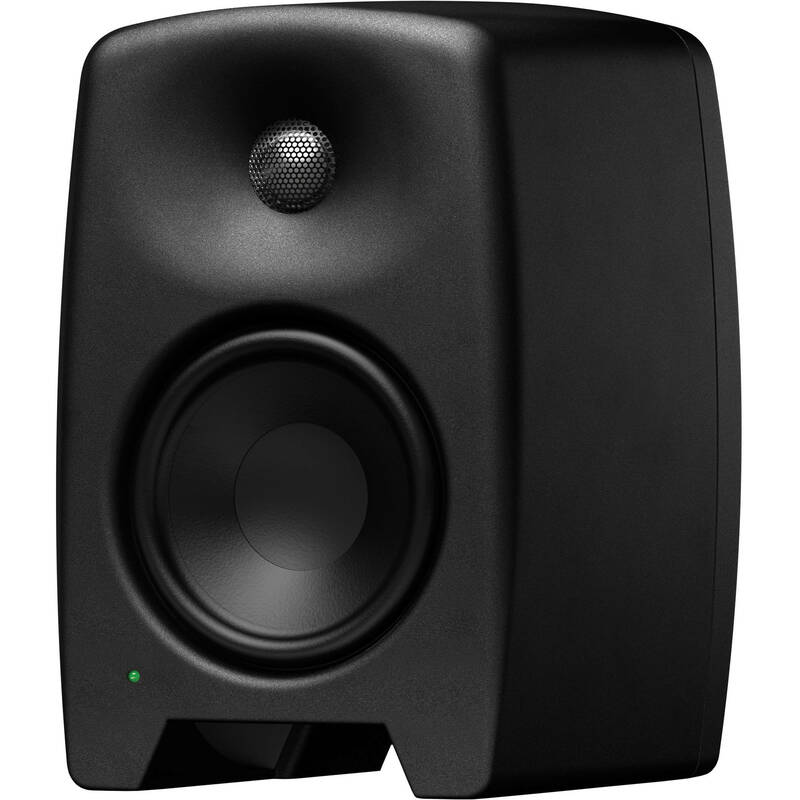 This black M030 Active Two-Way 5" Studio Monitor from Genelec offers a neutral and accurate reproduction of the source material, in a design that's committed to environmental sustainability. The cabinet of the M030 features rounded edges and a gently curved front and sides, which minimize edge diffraction and provide better imaging. It's made of a Natural Composite Enclosure, which is a compound of wood fiber and recyclable material. This is part of an initiative called Genelec Embedded Sustainability, where the products deliver a reduced carbon footprint, without sacrificing accuracy or performance. Another attribute which adds to the inherent sustainability of the M030 are its built-in class D amplifiers, which are more power efficient, lightweight, and have a cooler operation than the class A/B amplifiers that are typically used in active near-field monitors. Its 0.75" metal dome tweeter and 5" woofer are powered by 30-watt and 50-watt class D amplifiers, respectively. A feature called Intelligent Signal Sensing automatically puts the M030 into Standby mode, where it consumes less than 0.5 watts of power when an audio signal isn't present. When a signal is present, the M030 automatically powers on. A combo XLR and 1/4" TRS jack and an unbalanced RCA jack are provided for input. Room response controls optimize the EQ for bass and tabletop use. A dedicated Bass Control switch adjusts the response of even lower frequencies, to adapt the speaker to its environment. One position on the switch provides no bass EQ, for use when there is free space around the speaker. To compensate for surfaces near the speaker, the Bass Control switch enables you to roll off -2 or -4 dB. Box Dimensions (LxWxH) 13.8 x 9.3 x 8.9"
M030 Active Two-Way 5" Studio Monitor (Single, Black) is rated 5.0 out of 5 by 1.